After all the rich foods from the holidays, we all crave for something simple and comforting. Something that can be whipped up without a lot fuss with ingredients we already have on hand. This dish used up the last of our tomato harvest. Yep, believe it or not, we just finished up the last of our fresh tomatoes and it’s January! How did we still have tomatoes that weren’t frozen this late after the last of the summer garden? Green tomatoes. Back in October, before the first frost of the season, we harvested all the tomatoes from our garden. The ripe ones, were either made into tomato sauce and frozen or simply washed, dried and frozen whole. The green ones, (the smaller cherry tomatoes) were made into green tomato relish and the larger ones are left to ripen to be enjoyed fresh as they turn red. To ripen green tomatoes in the winter, wrap them individually with newspaper and layer them in a box. Place the box in the coolest and darkest place or your pantry and check every couple of days or so for ripe tomatoes. This method, we found, ripens the tomatoes slower and the result is sweeter than just leaving them out on the counter. It also seems that they ripen in stages rather than all at the same time with this method that’s why we still had freshly ripened tomatoes in early January. From our summer garden, we also had quite a few opo squashes that we couldn’t eat nor give away fast enough. So I peeled and cut number of them and dropped them in the freezer. This week, we decided to cook these squashes using the same method we used for the spicy sitaw (long beans). Put all the ingredients (except for the squash) in a food processor and process until you have a fine sauce. Heat 2 Tablespoons of Olive Oil in a skillet and pour the sofrito sauce in. Let it cook until it is bubbly and fragrant, about five minutes. Add the squash, stir and cook until the squash is tender. You shouldn’t have to add water as the squash usually renders enough liquid to cook in. However, if it starts to look to dry, add a little water, a quarter cup at a time. You don’t want this to be too saucy. Adjust the seasonings with salt & pepper before serving. Upo is the Bottle Gourd. Google has a couple of good sites where you can buy the seeds and learn how to grow them. Soaking the seeds really does speed up germination. My dad grew them in S. California, but I’m growing them here in Prescott, AZ. Like watermelon, the female flowers come first, die off, then the male flowers produce the fruit. I am so looking forward to my first crop. It reminds me of my dad. how are you? where are you? lol! :) i miss upo! 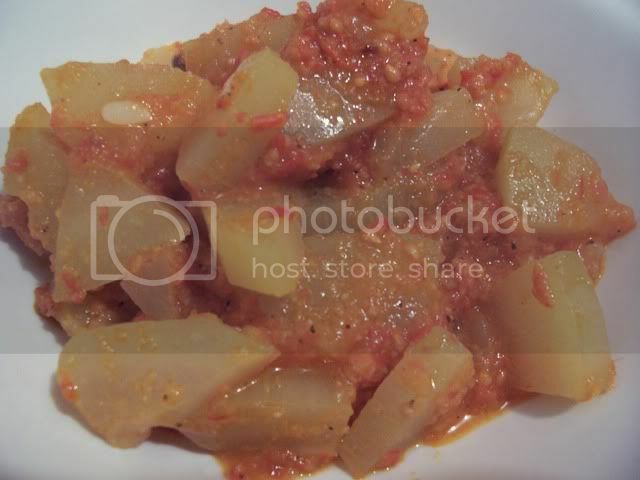 ginisa or this one with tomato sauce, i should try ir does it taste the same as the ginisa one with tomatoes? i guess huh? i agree, this is what we all need after all those holiday carbs!! !belated happy new year too!!! This sounds just what we need after the hollery & ivy! I don’t think we can get opo squash here, I think it’s similar to courgetes (zucchini) so I’m going to try it with that, or maybe peppers? inggit….you must have had a bumper crop of veggies JMom! belated happy new year (western) and an early Kung Hey Fat Choy! p.s. still am not too sure about what is upo and which is patola?